Oooh some very good recipes last week. 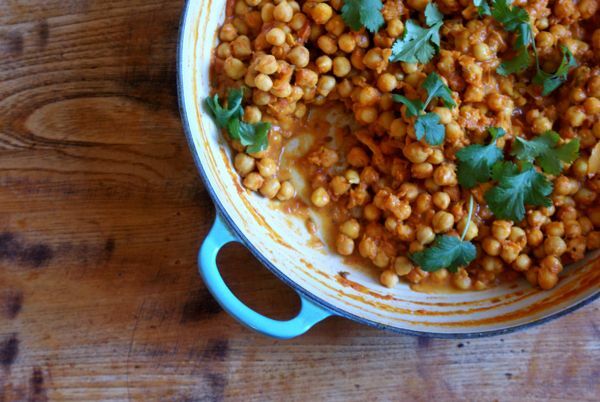 My new post is up on Brixton Blog – a quick and easy chickpea curry. You can whip it up in the time it would take for a takeaway curry to be delivered. Whenever we make this, it always comes out very thick, so we sometimes have it with rice. Either it’s cheap, simple and DELICIOUS. A great one to have in the freezer too. Recipe here. This recipe may exactly jump out at you (and the name is stupid), but it’s actually really easy, surprisingly delicious and low carb too – if you’re into that kind of thing. Recipe here. I am unapologetic in my love for Jamie Oliver. I’m sure he doesn’t write most of his own recipes anymore, but he clearly has a fantastic team and I think his recipes are superb. Especially the fact that they’re mostly quite balanced with lots of veggies. Anyway, gushing over, this recipe was lovely. A couple of notes: we did not make our own tortillas (I love the Tesco values ones as they’re quite small) nor could we get tomatillos (I used ordinary tomatoes). Also, we kind of ruined a frying pan trying to blacken the tomatoes, so maybe don’t bother. AND, it does not serve 16 people – I would say more like 4-6. Recipe here. This was so tasty, and I love that it’s full of beans and lentils too. You could eat it on it’s own as a kind of thick stew with a dollop of yoghurt. Or with some crusty bread. We had it with rice (the obvious choice). Recipe here. Very nice looking blog with lovely pictures, which rather dilutes my hopes that you might be interested in my Food Photography Workshops in London this April and May. If, by any chance, you are interested you can find details on http://camerahols.com/london-food-photography-workshops-spring-2014/ or on my blog.